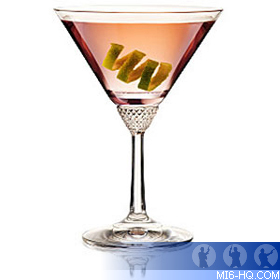 James Bond is renowned for his Vodka 'Vesper' Martini that he frequently drinks on screen and in print. Yet, few remember the classic cocktails that author Ian Fleming appropriated and described his secret agent as consuming throughout the novels. Often Fleming would take a classic recipe and offer his, or 007's own take on the drink, by specifying a less common vermouth or insisting on plenty of bitters. As the festive season fast approaches, David Leigh contributes a few recipes from his book "The Drinks of James Bond". While on the Silver Phantom from New York to Jacksonville in Live And Let Die, 007 orders Old Fashioneds for himself and Solitaire to go with chicken sandwiches, specifying Old Grandad bourbon. He also pairs his chicken dinner at the Sagamore Hotel in Saratoga with two Old Fashioned. 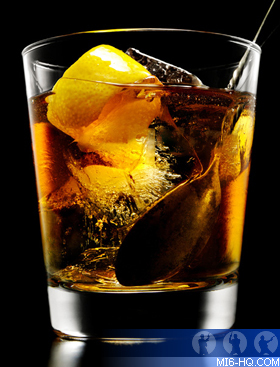 A reference to the Old Fashioned first appeared in print in 1886 when describing, as a reaction against the overly complicated drinks that had become popular, a return to an old-fashioned style coctail. Add the sugar and bitters to a tumbler with a drop of water to dissolve, and then top up with bourbon. Add an ice cube and a slice of orange or lemon peal if you want. In The Man With The Golden Gun James Bond is acting as Scaramanga's personal assistant at a hoods' convention at the Thunderbird Hotel in Negril on the west coast of Jamaica. In the hotel bar he orders a Pink Gin, specifying Beefeater gin and plenty of bitters. Add a few drops of Angostura bitters to a cocktail glass and top up with chilled gin. James Bond's first ever drink is an Americano, which he orders in Casino Royale and the drink reappears in From Russia With Love and while killing time in Paris in From A View To A Kill. The Americano was invented in Milan in the 1860s. It was originally called a "Milano-Torino" after the cities from which the two main ingredients came. 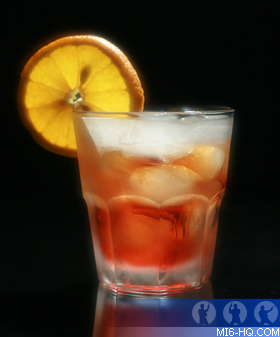 Pour the Campari and Cinzano over ice in a glass, top up with soda water and add the slice of lemon peel. The complete Drinks of James Bond e-book is now available on Amazon. David Leigh has been a fan of James Bond ever since he borrowed a paperback copy of Casino Royale from his dad's bookshelf at the age of 8. Although he never returned it, he may do one day. You can also find David at The James Bond Dossier, which he has run since 2002, as well as authoring a book of James Bond's drinks.